The Maryland Eastern Shore encompasses a large geographical area with a diversity of historic towns, beaches, and beautiful natural areas. These maps serve as a guide to help you explore the region on the eastern side of the Chesapeake Bay. This map shows the entire region. The following pages show closeup details and driving directions to each of these destinations. Each town has its own unique character and fun things to do. Assateague is located on the most southern part of Maryland along the Atlantic Coast. It is about 140 miles and a 3-hour drive from Washington DC. From U.S. 50 East: Cross the Chesapeake Bay Bridge and follow signs for Ocean City. A few miles outside Ocean City, turn right on Route 611 to Assateague Island. From Virginia Beach: Cross the Chesapeake Bay Bridge Tunnel, stay on U.S. 13 North, then take U.S. 113 north towards Snow Hill/Ocean City. Turn Right on MD 376, then turn right on MD 611 to Assateague Island. There are two entrances to Assateague Island National Seashore. Assateague's north entrance is at the end of Route 611, eight miles south of Ocean City, MD. The south entrance is at the end of Route 175, two miles east of Chincoteague, VA. There is no vehicle access between the two entrances on Assateague Island. Cambridge is located about 57 miles and an hours drive from Annapolis. From U.S. 50 East: Cross the Chesapeake Bay Bridge, continue on Route 50 for about 40 miles. After you cross the Choptank River Bridge, make the first right onto Maryland Avenue. Go about a half-mile, cross over a small drawbridge and continue straight where Maryland Avenue becomes Market Street. Turn Right on Spring Street. At the intersection of High Street, you are in the center of town. Chesapeake City, located on the northern end of the Maryland Eastern Shore, is approximately a one hour drive from Baltimore and a two-hour drive from Washington DC. The town is easily accessible from I-95 and is near the Delaware and Pennsylvania borders. Chesapeake City sits on the Back Creek across from the Canal Wildlife Management Area. From I-95: Take I-95 N, follow signs towards Wilmington and Philadelphia. Exit at MD-272 S/North East Rd. Take US-40 E and MD-213 S to Chesapeake City. From U.S. 50 East: Cross the Chesapeake Bay Bridge, Follow signs to US-301 North, Turn left to take MD-213 N, follow to Chesapeake City. Chestertown is a small town in Kent County, Maryland, located across the Chesapeake Bay from Baltimore. It is just a one hour drive from Annapolis. The town sits on the Chester River. From U.S. 50 East: Cross the Chesapeake Bay Bridge, Follow signs to US-301 North, Turn left to take MD-213 N, follow to Chestertown. Crisfield is the most southern point of Maryland that is located along the Chesapeake Bay. It is 125 miles and just over a 2-hour drive from Annapolis. From U.S. 50 East: Cross the Chesapeake Bay Bridge, Follow signs to stay on U.S. 50 East to Westover. Take MD 13 South to MD-413 South. Follow signs to Crisfield. Easton is located right off of U.S. 50 about 40 miles and less than a one hour drive from Annapolis. The small town has lots of restaurants and shops and is a popular destination for visitors to stop while on route to Ocean City. From U.S. 50 East: Cross the Chesapeake Bay Bridge, Follow signs to stay on U.S. 50 East to Easton. To reach the center of town, go right on 322-Easton Parkway and then turn right on 565-N. Washington Street. Kent Island is located right over the Chesapeake Bay Bridge and is considered the Gateway to the Maryland Eastern Shore. 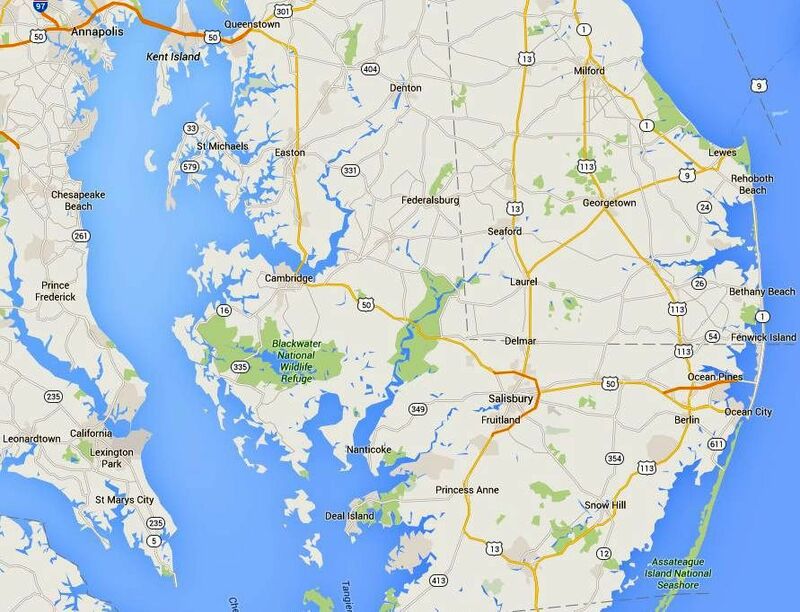 Kent Island is just a half hour drive from Annapolis. From U.S. 50 East: Cross the Chesapeake Bay Bridge. Take the first exit turning right onto MD-Route 8. Ocean City is the largest and most popular beach town on the Maryland Eastern Shore. It is located approximately 150 miles and a three-hour drive from Washington DC in normal traffic. From U.S. 50 East: Cross the Chesapeake Bay Bridge. Follow signs to continue on US 50 East to Ocean City. US 50 Crosses into Ocean City at the south end of town below the Boardwalk. You may also take Route 90 which crosses the Bay and enters Ocean City at 62nd Street. Oxford is a small town located on the Choptank River in the central part of the Maryland Eastern Shore, about a one hour drive from Annapolis. From U.S. 50 East: Cross the Chesapeake Bay Bridge. Follow signs to continue on US 50 East towards Ocean City. Go right on 322-Easton Parkway and then turn right onto 333-Peachblossom Road. Follow 333 to Oxford. From April through November, you can cross the Tred Avon River on the Oxford-Bellevue Ferry to get to St. Michael's more quickly. The ferry is closed during the winter months. Rock Hall is a small town on the northern end of the Chesapeake Bay about 60 miles and 1.25 hours from Annapolis. It is located just north of the Chester River. From U.S. 50 East: Cross the Chesapeake Bay Bridge. Follow signs to US 301 North. Exit onto MD-213 N/ Centreville Rd. Follow MD-213 N. Turn left onto Spring Ave. Turn right onto High St. At the traffic circle, take the 2nd exit onto MD-20 W/High St. Turn left onto N. Main St. in Rock Hall. Salisbury is the largest town on the Maryland Eastern Shore and home to Salisbury University, to a 140-acre campus that is part of the University System of Maryland. It is located 2.5 hours from Baltimore and Washington DC and 30 miles from the Atlantic beaches. Salisbury is at the junction of east-west U.S. Route 50 and north-south U.S. Route 13. From U.S. 50 East: Cross the Chesapeake Bay Bridge. Continue on US-50 E for 83 miles. Merge onto US-301N/US-50 E. Continue for 21 miles. Use the right two lanes to take the US-50E exit towards Ocean City, continue onto US-50E/Ocean Gateway. Use the middle lane to take the US-50 Business exit toward Salisbury. Smith Island is a small island located 9 miles off of Crisfield, MD in the heart of the Chesapeake Bay. You must take a boat or ferry to the island. From U.S. 50 East: Cross the Chesapeake Bay Bridge. Continue on Route 50 East through Easton and Cambridge. Shortly before Salisbury, take the Salisbury by-pass, following signs for 50 East and 13 towards Ocean City. Stay on this road and do not exit for any further route 50 signs or for business 13. The by-pass will end on Route 13 heading south towards Princess Anne. Continue on 13 through Princess Anne and after approximately 5 miles watch for Route 413 on the right towards Crisfield. It is well marked. Take 413 to the end. Ferries to Smith Island are at the dock at the end of 413. All ferries leave at 12:30 p.m. from the city dock. Return trips from the island are at 7:00 a.m. from Tylerton and Ewell. Often there are additional ferry runs that leave the island at 3:30 p.m. and Crisfield at 5 p.m.
St. Michaels is a quaint waterfront town and a regional favorite, located on the Maryland Eastern Shore. It is located 50 miles and just a one hour drive from Annapolis. From U.S. 50 East: Cross the Chesapeake Bay Bridge. Continue on Route 50 East. Bear right onto the Route 322/Easton Bypass. Follow Route 322 through three traffic lights. At the fourth light bear right onto Route 33/St. Michaels Road. Follow that road for nine miles to the town of St. Michaels. Tilghman Island is a small town on the Maryland Eastern Shore. It is an hour and 20-minute drive from Annapolis and a 20-minute drive from St. Michaels. The island is accessible by car. From U.S. 50 East: Cross the Chesapeake Bay Bridge. Continue on Route 50 East. Bear right onto the Route 322/Easton Bypass. Follow Route 322 through three traffic lights. At the fourth light bear right onto Route 33/St. Michaels Road. Follow the road, pass through the town of St. Michaels and continue for 13 miles to Tilghman Island.